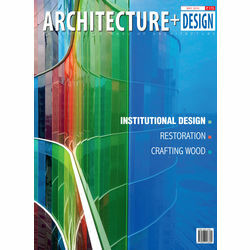 Architecture + Design, is in its 26th year of publication and is the only national monthly of architecture for architects, designers, students of architecture, construction industry, building promoters and planners. Based on a very contemporary format, it portrays the modern trends in building technology, research and development in the process of design, project profiles, conservation and environmental issues, product and material information, etc. Focused at an entirely new segment of readers, A+D makes good business sense for those who are looking at promoting their products to an industry, which could add to their institutional sales substantially. A+D, is also instrumental in constituting the only national awards "A+D & Spectrum Foundation Architecture Awards" which has generated tremendous response from the leading architects and professional bodies of the country.